Last updated 28 September 2018 . By Faith Strickland. Much like me to a 3am Maccy D’s, West London is a magnet to smart and illustrious new openings, that burn as brightly as a floodlight before being dimmed by the next big name. Zuaya is the latest buzzed about hub to cast its glow over the city, but with a renowned chef and an interesting fusion menu, it might just have sticking power. ‘Welcome to the jungle’ flashes in neon above the staircase of this Kensington hideaway - though it’s less Guns ‘n’ Roses and more Tomb Raider. 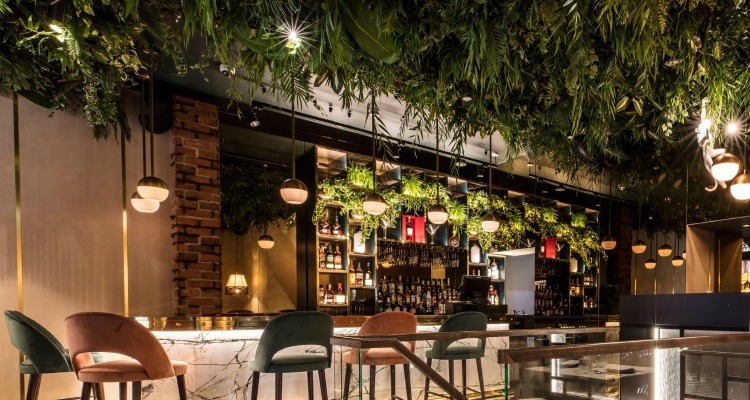 It’s as if the place has been reclaimed by nature, albeit a very trimmed and considerate version - the ceiling sways with faux fauna and green moss clings to exposed brick columns. Next to the greenery, smart pared-down interiors give the sense of an old train carriage, including baby pink crushed velvet chairs and tasselled lamps hanging over each table. Zuaya has been reclaimed by nature, in a very West London way. While the interiors are worth a visit alone, Zuaya has got more than one ace up its sleeve in this hostile restaurant climate. 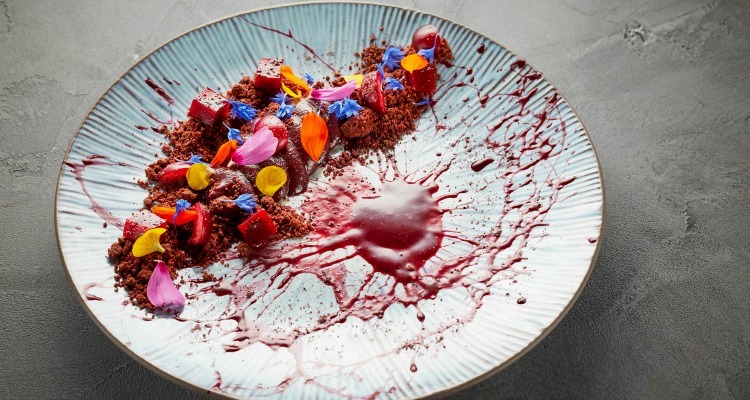 Francisco LaFee has been chosen to head up the kitchen, and with experience in London’s top restaurants, the chef is here to make his own mark. The result is a fusion of Mediterranean and South American flavours, with a long list of small plates, a few grill dishes and stews. It’s the starters where his skill comes out, in riotous colour and flavours. Ceviche a la Brasa (£12) was an Alice in Wonderland topsy turvy dish with a delicate sweet potato ice cream that melted against warm chunks of white fish, and thrice-washed red onion to take away the sharpness. Crispy duck salad (£8) was as much a piece of theatre as a dish, as the meat torn apart at our table by the waiter, and then lightened with a tangy raspberry hoisin and watermelon. If the starters were light, fresh and pretty, the mains were a more grown-up, heavier affair, that reflected authentic, every day South American flavours. Tamarind pork belly (£17) was a chunky, stodgy dish, consisting of potatoes grown in high-atmosphere, giving them an even more dense taste than usual - it was a bit too bulky after all those starters. Puddings pulled it back for us, with a chocolate surprise (£9) that exploded with rich brownie-like cake and sharp raspberry coulis. The kitchen combines South American and Mediterranean flavours. I'm sucker for a pretty face, but Zuaya might just be the one to make me settle down. From dreamy interiors through to plates that contrast sharp against sweet, and rich with fresh, the kitchen takes the best elements of each cuisine for fusion cooking that actually works.